Here is the Better Offer on the US Airways Mastercard – 50k Miles + 10k Miles On First Anniversary! As many of you probably saw, the blogosphere was blitzkrieged with dozens of posts from bloggers promoting the new offer on the US Airways Mastercard of 50,000 miles after 1st purchase. It is a good offer and an improvement over the old offer but most of the bloggers (except Frequent Miler) left out one key detail: There is actually an even better offer for the same 50,000 miles after 1st purchase PLUS 10,000 miles on your first card membership anniversary. 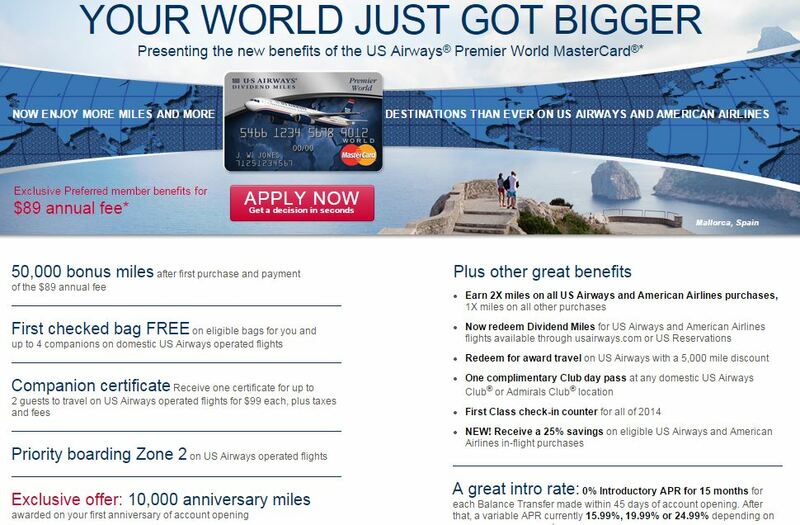 Here is a link to that offer – US Airways Mastercard with Anniversary Bonus. See that little notice in the bottom left? Bingo. I think this is a very strong offer and one most people who currently do not have an open US Airways Mastercard should go for. Yes, it says this offer is for Preferred members only but in the past anyone has been able to get this bonus and I haven’t read any reports of this changing. Even on Frequent Miler’s post, someone commented they were approved for the card with no status with US Airways and a co-worker of mine was also approved who did not have status. Barclays will stop accepting new applicants for this card at some point in early 2015. This is a fact even though we don’t know the exact date yet. Get it now before you lose the chance to apply for this card for good. It truly is a strong offer as in the highest ever offer on this card. 50,000 miles for spending a dollar – when do you see those type of offers anymore? Yes, you have to pay the $89 annual fee upfront but would you pay $89 for two domestic roundtrip flights? What about a one-way business class ticket to Europe? Yup, I thought so. These miles will eventually convert to American Airlines miles at some point in 2015. So even if you think you have no use for US Airways miles, think of this as a way to accumulate extra AA miles that you can use in 2015. If you do fly US Airways, this card comes with perks such as free checked baggage, priority boarding, an annual companion certificate at $99 and a 5,000 mile discount when booking US Airways awards. That’s a pretty good set of ancillary perks. Now of course, you didn’t hear about this improved offer from other bloggers because it wasn’t their affiliate link – it’s really quite that simple as they don’t want to jeopardize their “sales”. Once Frequent Miler posted it, all of the other blogs could have at least mentioned it (I know many of them see his posts) but I didn’t see any other blog update their post (update: MilesforFamily and MommyPoints did mention the better offer later on). I know Travel Blogger Buzz brings awareness to this issue and I’m just doing my part to help. With no affiliate links on my site, I try to bring you the best, unbiased offers and with several posts on increased offers that other blogs won’t post (75k Amex Business Gold, 50k HHonors Points, $50 bonus on Fidelity Amex) I’m helping my readers get the best bang for their credit card application. Be smart with who you follow and especially on whose credit card links you click on. Hi, love your site! Wanted to let you know that I have updated my blog with the better link as soon as I saw the better offer, which was within hours. Also, I believe Mommypoints has also pointed the better offer in her post. Not saying that most bloggers have written about it, but certainly more than one. Yes, you are correct – thanks for bringing this to my attention. I’ve updated my post. I certainly give you & MommyPoints credit for doing the right thing but the majority of bloggers (especially the really big guys) haven’t said a peep about it. Thank you so much for updating the post, I really appreciate it. Affiliate situation is a very tricky subject and I can understand where you are coming from. There is a definite conflict of interest, something I constantly struggle with. Unfortunately, majority of my (small) profit comes from credit card apps. If I gave up that source of income, I would be writing for free. Considering how much time my blog takes, I’m not ready to voluntarily go down that path. The main thing is trying to put readers first, which is what I’ve tried to do on my blog since day one. If you don’t get approved right away, does that mean you won’t get the 10,000-mile anniversary bonus? Don’t know where I heard that, but I wasn’t instantly approved despite my high credit score so I don’t know what’s up! Hey I’d love to start following you, this article convinced me, but I follow all my travel blogs on Facebook so that I can get direct notifications when they post new articles. I didn’t find a fb link for you and I searched on fb and found nothing. If you have one, I’d love a link. If you don’t, I would love if you made one…I think it would be beneficial for people like me who want to follow your blog. Followed you on twitter, but I use that medium far less. Thanks for the good affiliate free article!